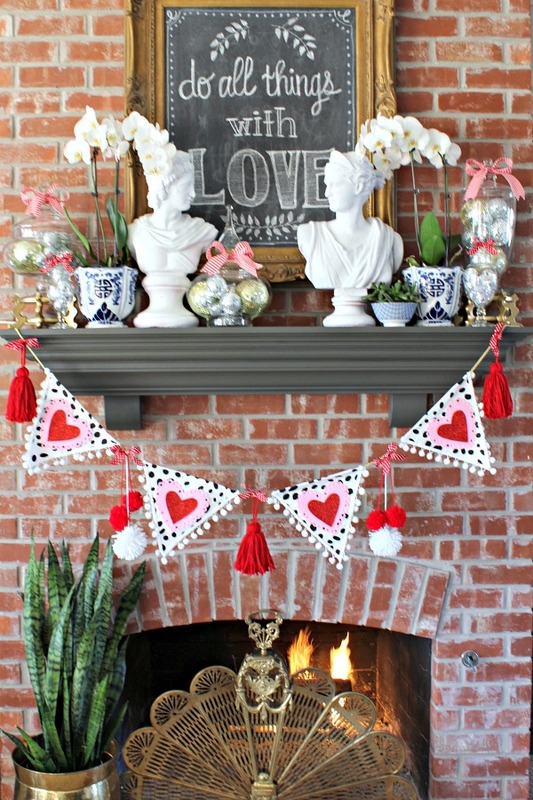 It seems like we just packed up the Christmas decorations, so it's hard to believe that Valentine's Day is right around the corner! 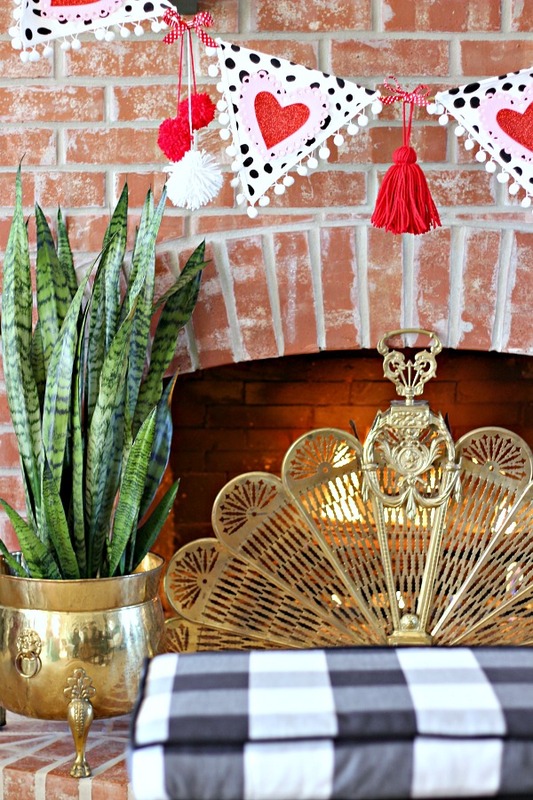 I got a little crafty with a DIY no sew garland and decked out the mantel for the upcoming holiday. 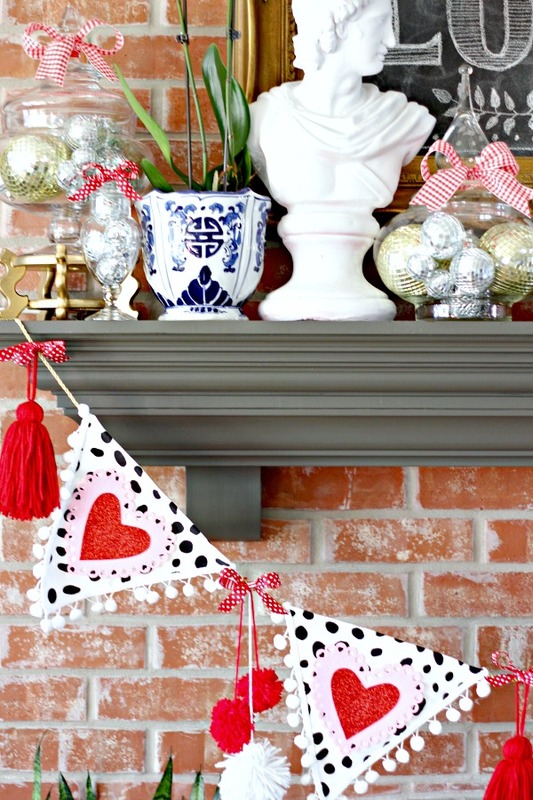 Use the decorative hearts to determine the size of of your flag for the garland. 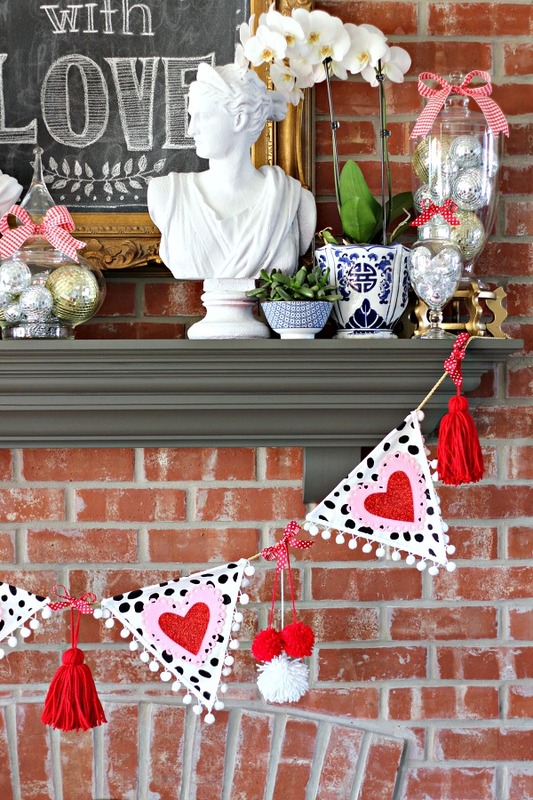 Also consider how long your garland will be to decide how many flags you need depending on their size. 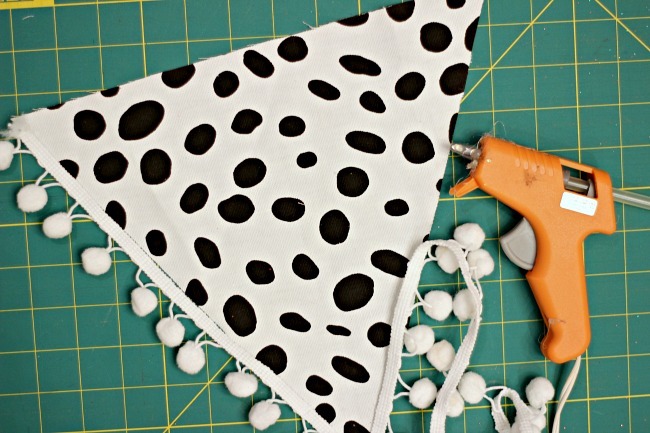 Cut out flags and glue the pom pom trim on top of the cut bottom edges to cover the rough edge. Leave the top side plain. 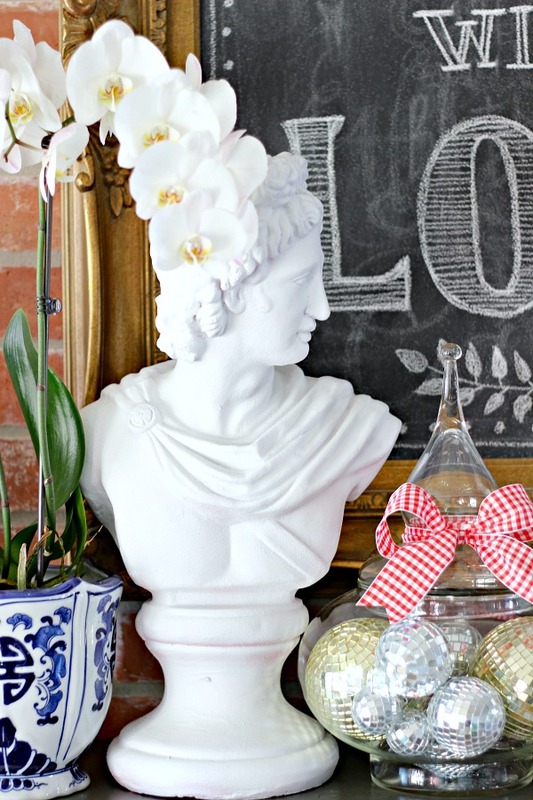 Make tassels and pom poms if desired to accent garland. 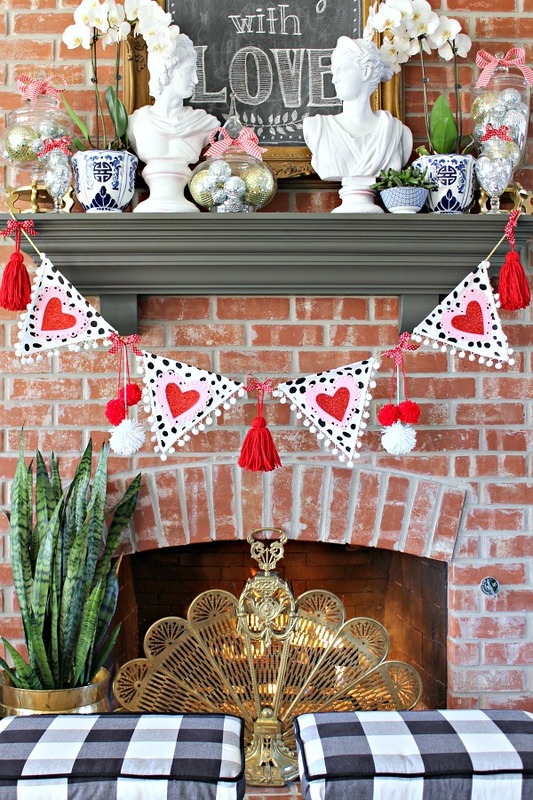 They are SO easy, be sure to check out my pom pom tutorial and tassel tutorial. I wanted the tassels to be pretty large and full, so I wrapped the yarn about 100 times around an old license plate for those. 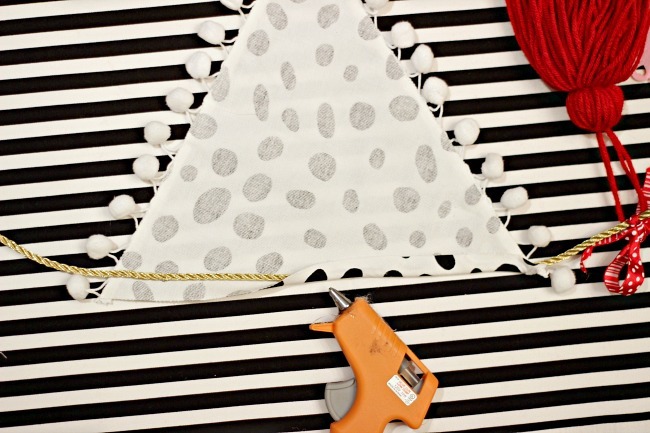 Measure the length of rope, ribbon, or cord you need and lay the flags out along the cord where you want them to go. Then fold the top edge of the wrong side over the cord and hot glue it down. Tie tassels and pom poms in between flags. Lastly, glue hearts in place to the front of the flags. I just used a few tiny dots of glue in case I want to use this garland for another occasion later. After hanging the banner, I switched the chalkboard message and decorated the mantel. These apothecary jars are working hard this season. For Christmas they held vintage ornaments, then I switched to gold and silver mirrored balls for New Year's, carried over the bling for a birthday party, and with a switch of ribbon color they're working for Valentine's Day, too! I hung the chalkboard over the mantel for Christmas, and I'm still enjoying it being there. So far, it's proclaimed Merry Christmas, Happy New Year, Happy 16th Birthday to Caleb, and now Happy Valentine's Day! Several have asked about my chalkboard technique, and here's the secret... I search Pinterest to find a design or phrase that I like, and do my best to imitate it! Usually I switch up some of the lettering or art to work for me, but it's a good starting point. 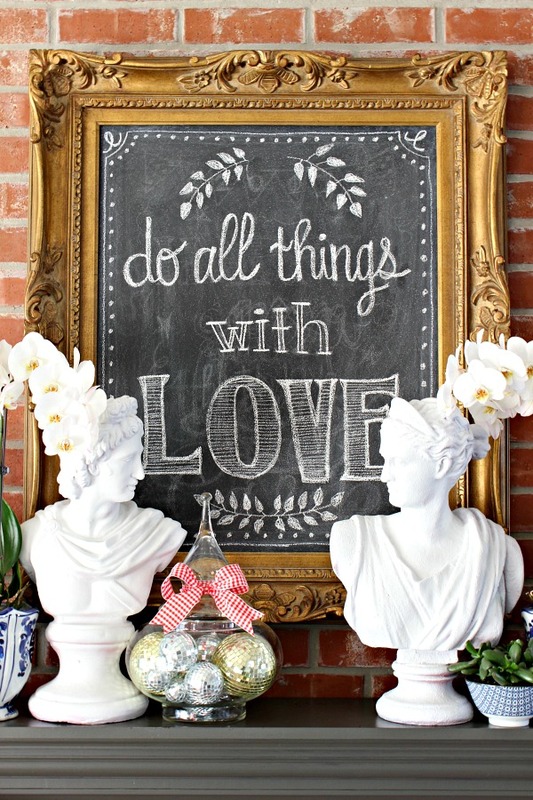 I used this free printable as my inspiration for this chalkboard. I also received this book for Christmas and it's full of great tips, ideas, and lettering styles. 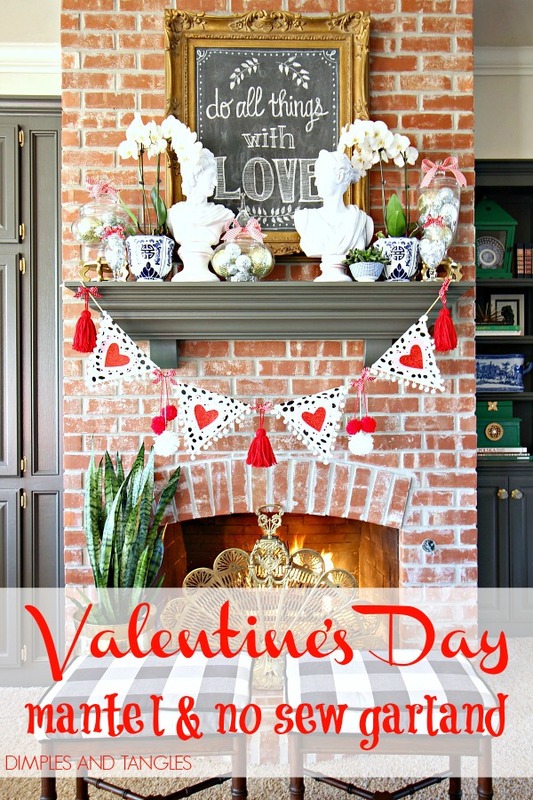 If you're feeling festive for Valentine's Day, be sure to check back in next Wednesday when the My Five Favorites gals and I will be sharing our favorite ways to celebrate the day! It's all so cheerful and happy Jennifer! Especially love your chalkboard! Seriously you need to make those garlands and sell them - I'd buy one in a heartbeat!!! Well.... that's an idea! Thanks, glad you like it! 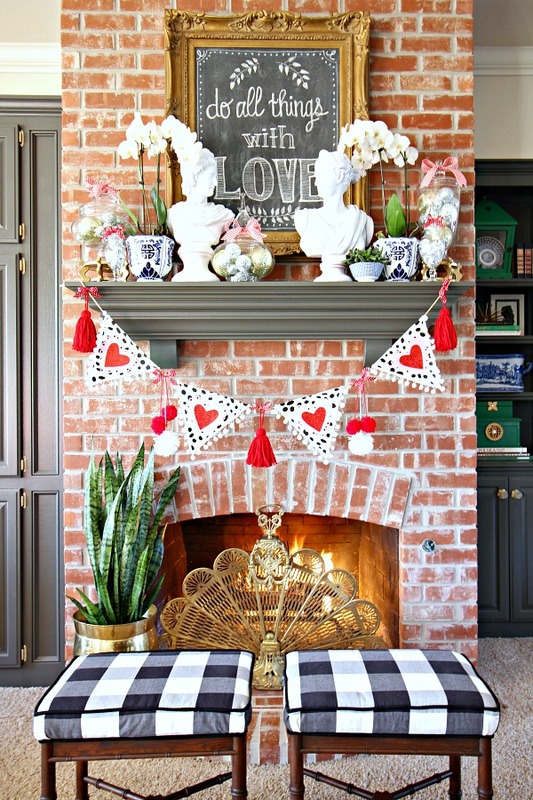 Cute garland and chalkboard. I just came home from Michael's & I think their entire coastal collection for spring was inspired by you. If you haven't seen it, you should take a look. I can't wait until it goes to 40% off as there are several things I want. Always beautiful! My favorite are the poms. 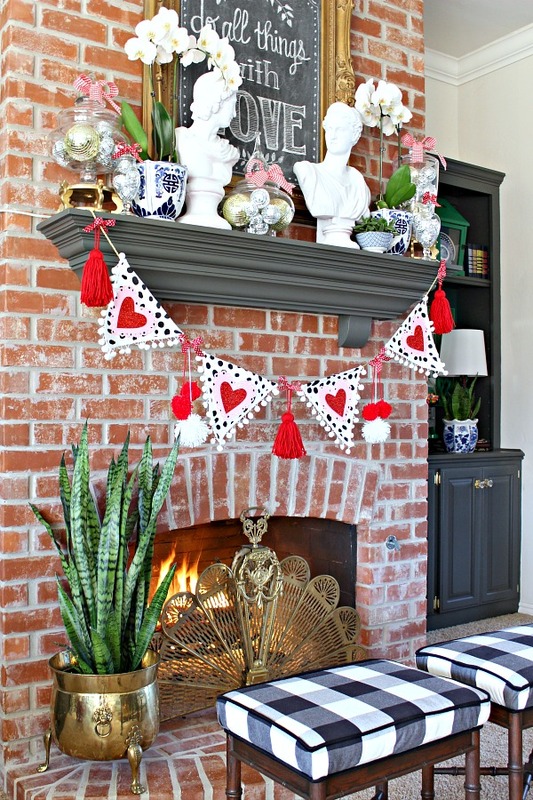 Love that you switched out your stools to showcase the buffalo check with the red accents of Valentine's Day. Where did you get your stools? Any idea where I could find something similar?